1 of 2 Heat oven to 250 degrees . 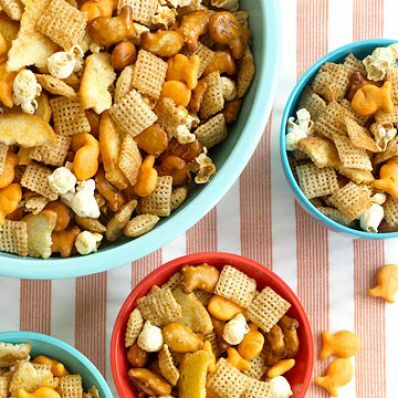 Stir together Chex, popcorn, both kinds of Goldfish and the bagel chips. Whisk together butter, syrup, soy sauce and cinnamon. Drizzle over Chex mixture; stir well. 2 of 2 Spread mixture onto a rimmed baking sheet. Bake at 250 degrees for 40 minutes, stirring every 15 minutes, or until golden. Cool completely.